Easter Sunday is sure to become more magical and exciting for kids as Eastwood City brings ‘Alice in Wonderland: A Children’s Musical’ to Once Upon an Easter Wonderland. 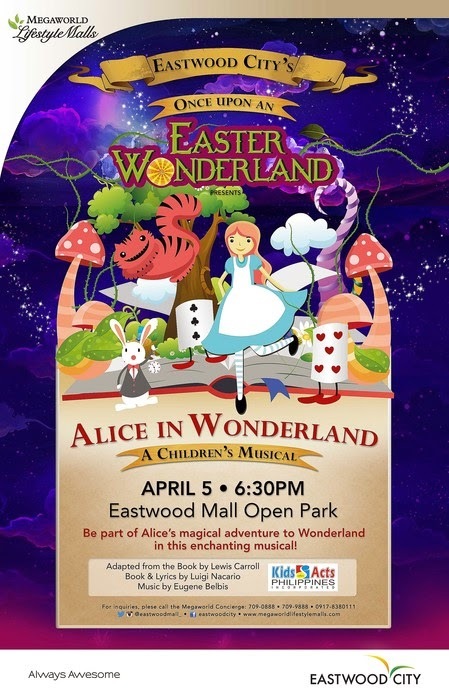 A world-class children’s musical production from Kids Acts Philippines, ‘Alice in Wonderland: A Children’s Musical’ will be staged on April 5 --- 6:30 p.m. at the Eastwood Mall Open Park as one of the main attractions of Eastwood City’s Once Upon an Easter Wonderland. Now on its 46th year, the CCP Summer Dance Workshop is once again paving the way for young dance talents to achieve their dreams to become professional dancers. 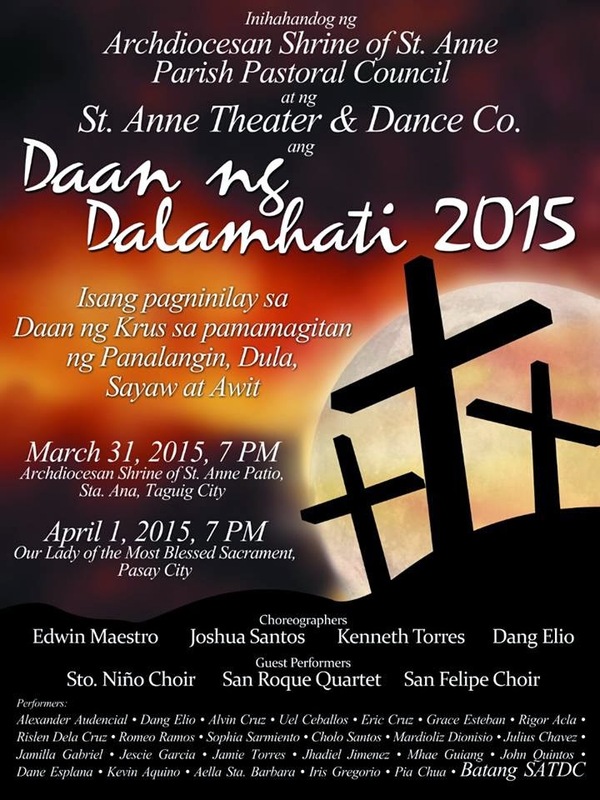 Starting on April 7, 2015, dance students from all over the country will flock to the Cultural Center of the Philippines for the five week-long summer dance workshop. Esteemed Ballet Philippines current company members and alumni will guide these aspirants in honing their craft. The workshop gives courses in Classical Ballet for all ages, Modern & Contemporary Ballet, Creative Movement, Jazz, and Hip Hop for kids and teens. 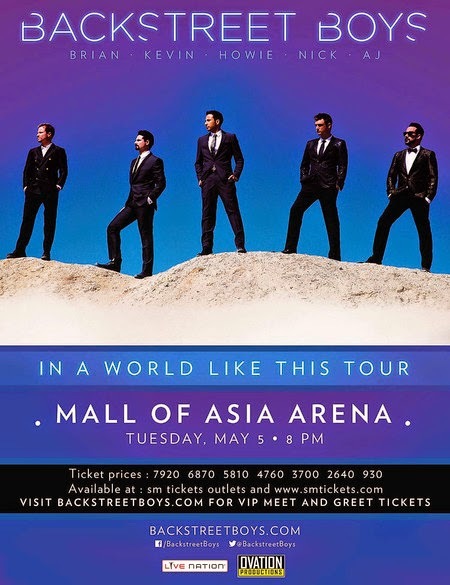 Backstreet Boys, acclaimed as the best-selling boy band of all time which dominated the music and recording industry from the early 1990s onwards, is coming to Manila to do a major concert on May 5 at the Mall of Asia Arena in Pasay City. The group is loved for its many huge hits like “I Want It That Way,” “Everybody (“Backstreet’s Back”),” “As Long As You Love Me,” “I’ll Never Break Your Heart,” “Anywhere For You,” “Larger Than Life,” “Show Me The Meaning Of Being Lonely,” “This Is Us,” “Never Gone,” “Unbreakable,” and many more. With over 130 million records sold worldwide, Backstreet Boys has left its mark in the music and recording industry as one of the world’s top-selling music artists. Rotary International District 3830 in cooperation with Royale Chimes Concerts & Events, Inc. is bringing to the country the master class in Elvis tribute acts, 'The World Famous Elvis Show' with Chris Connor and The Steels. 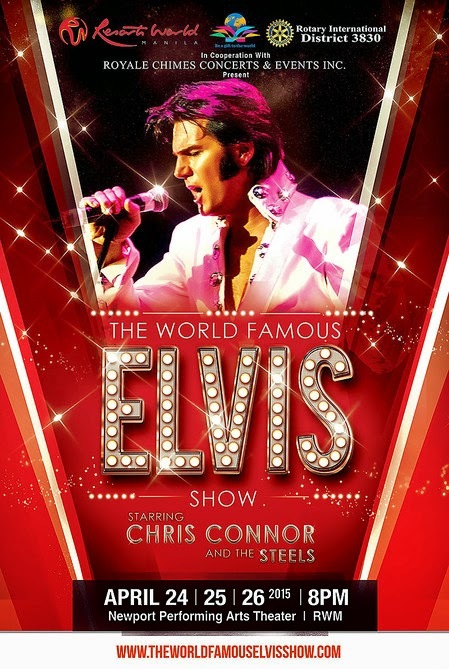 Voted in 2014 as the 'World’s Best Elvis Performer' via a worldwide official fan poll, Connor takes the Newport Performing Arts Theater stage in Manila this April (24, 25, and 26). 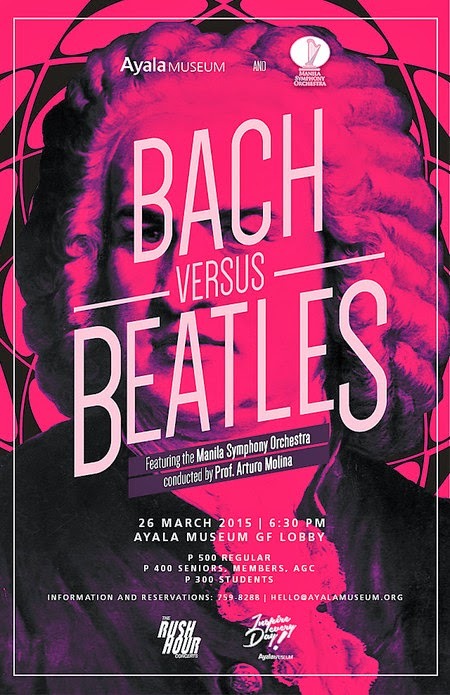 Ayala Museum, in partnership with the Manila Symphony Orchestra, proudly presents its first Rush Hour concert for 2015 entitled Bach versus Beatles on March 26, 2015, 6:30 pm at the Ayala Museum Ground Floor Lobby. The Manila Symphony Orchestra will be conducted by Professor Arturo Molina and play the music of German composer Johann Sebastian Bach in commemmoration of his 330th birth anniversary. The hits of legendary English rock group The Beatles will also be performed by the orchestra in this rare musical mash-up. 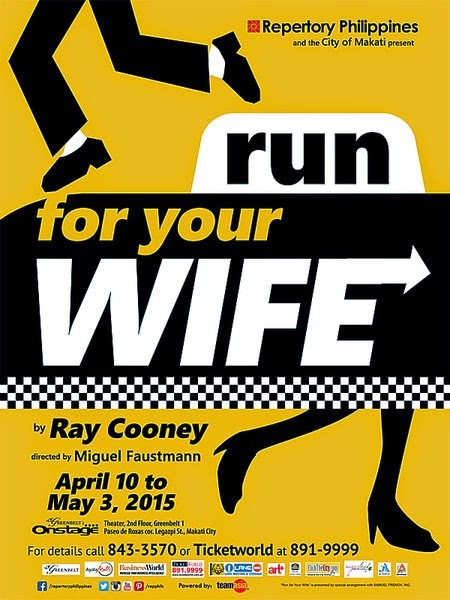 Repertory Philippines and the City of Makati present "Run for Your Wife" happening this April 10 to May 3, 2015 at Onstage Greenbelt. The story of London cab driver John Smith, with two wives, two lives and a very precise schedule for juggling them both. With one wife at home in Streatham and another at home in Wimbledon, and with occupants of the flat upstairs at the latter location. Sinag Maynila is the country’s newest independent film festival that showcases quality and thought-provoking movies from young, non-mainstream Filipino filmmakers. 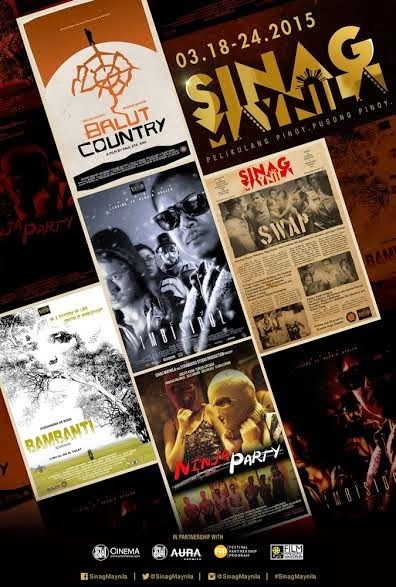 Conceptualized and helmed by its CEO and Founder Wilson Tieng, together with world-renowned and internationally acclaimed film director Brillante Mendoza as Festival Director, Sinag Maynila gives grants to independent filmmakers so they can develop their individual material to a full-length film for public exhibition. 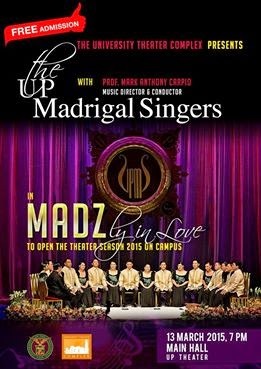 The University Theater Complex officially opens the theater season of 2015 on Friday, March 13, 2015 at 7 pm with no less than the world famous choral ensemble, the UP Madrigal Singers. The evening concert entitled MADZly in Love features well-known madrigals, Filipino classics, love songs and pop tunes, and a few selected novelty songs to certainly delight the audience. 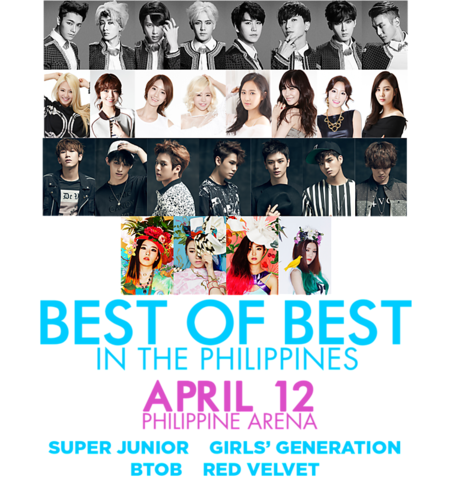 Head to Philippine Arena on April 12, 2015 and catch "Best of Best KPOP Concert 2015" featuring Super Junior, Girls Generation, Red Velvet, BTOB Live in Manila. Shuttle express to and from the Philippine Arena will be available with a minimal charges of Php 50 Roundtrip and is availabe at Ticketworld and SM Tickets online as well as outlets. 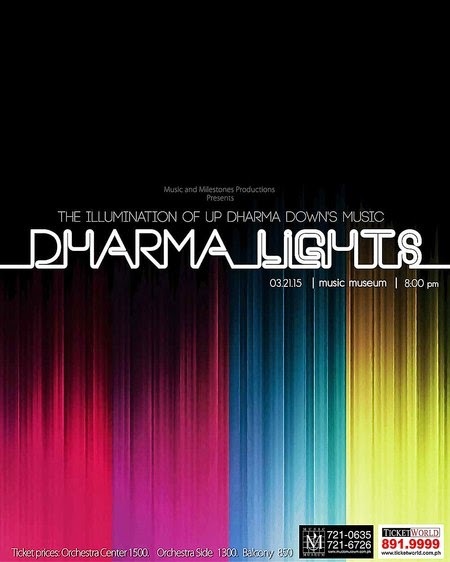 Music and Milestones Productions presents "Dharma Lights: The Illumination of Up Dharma Down’s Music" on March 21, 2015 at Music Museum. Up Dharma Down takes elements from different genres and combines them to create a sound that is uniquely their own. Many of their listeners have tried to categorise their music, but the best way to understand their music is to press play. They have been with independent label Terno Recordings since 2004. For ticket inquiries, please call Ticketworld at (63 2) 891-9999 or Music Museum at (63 2) 721-0635 or (63 2) 721-6726. Jazz, a classy genre. 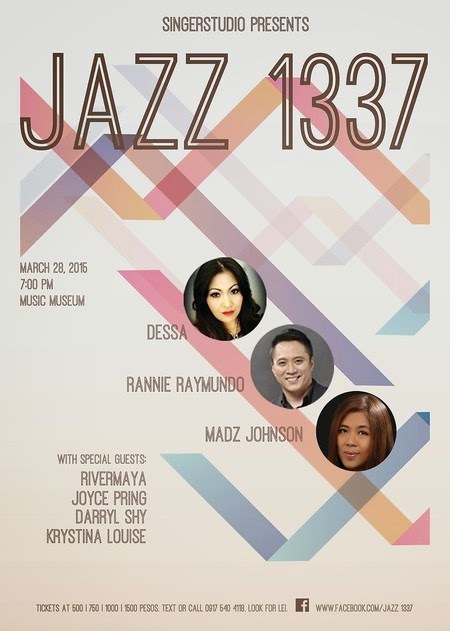 1337, slang for “elite.” This slang-y, classy concert on March 28 at the Music Museum is Not Quite Jazz - just new takes on familiar songs. Headlining the show are Vegas-based Dessa, Rannie Raymundo, and Madz Johnson, US-based jazz-soul-funk artist, along with premiere band, Rivermaya, DJ Joyce Pring, Darryl Shy and Krystina Louise [The Voice of the Philippines, S1 and S2], and surprise guests. The Cultural Center of the Philippines and Tribung Pilipino Foundation headed by Danny Dolor, presents Harana sa Dapit Hapon on March 11, 2015 at the Bulwagang Nicanor Abelardo (CCP Main Theater Lobby) at 4:30pm. Featured artists are sopranos Gloria Coronel and Liza Cabahug, and tenor Lemuel dela Cruz for the first part of the program, and violinist Gilopez Kabayao and pianist Corazon Kabayao together with their daughters, violinists Sicilienne and Farida Kabayao for the second part. The Irish band composed of Danny O’Donoghue (vocals, piano), Mark Sheehan (vocals, guitar), Glen Power (vocals, drums) is about to set foot in Manila for the 3rd time. It just goes to show how much these three talented and passionate musicians love performing for Filipinos. The Script at Mall Of Asia Arena, Manila will be happening on April 17th 2015. If you haven’t been to a The Script Concert and is going or planning to go this April, here are some of the awesome things to expect when you go see the Irish band perform on stage.